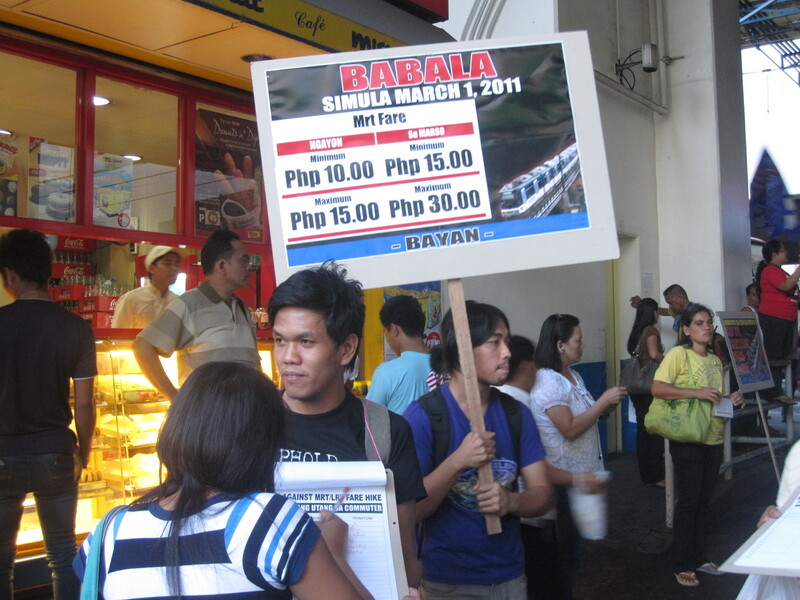 Determining how much exactly the fares will increase as “provisionally” approved by the LRTA could be a little tricky. 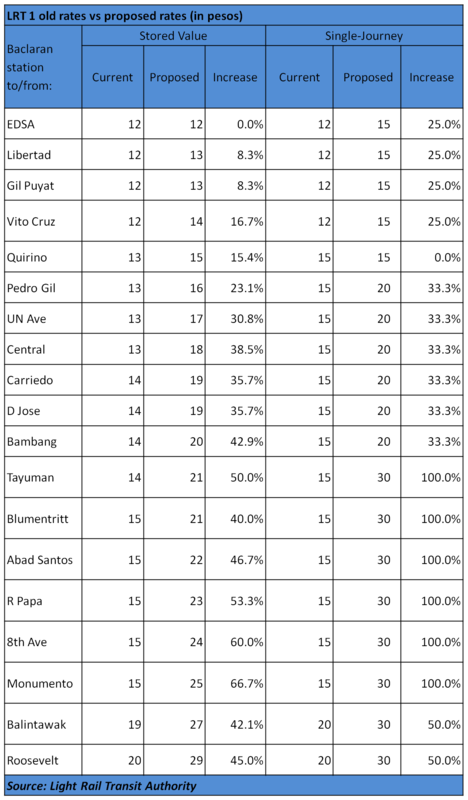 A Newsbreak article simplified the adjustments, which government hopes to implement starting March 1, by using averages for the three light rail systems – LRT 1, LRT 2, and MRT. 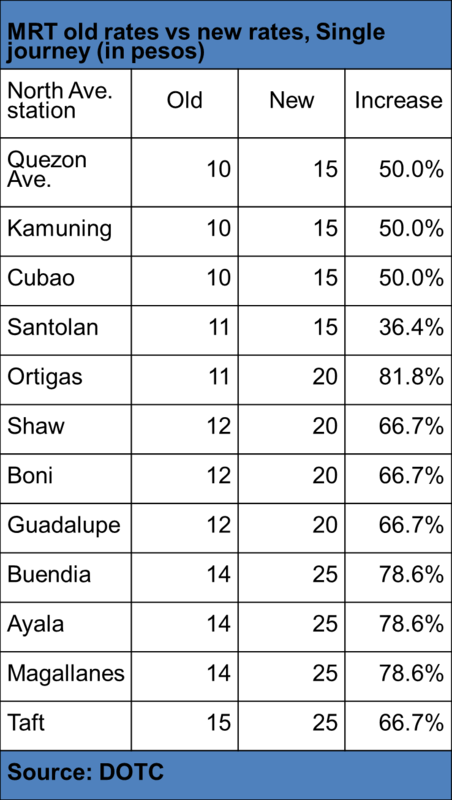 The second column in the table below shows the average distance that a commuter usually travels (based on data from the DOTC). The proposed fare, in the fourth column, is the new P11-boarding fee approved by the LRTA plus the average trip length (with a proposed rate of P1 for every kilometer). 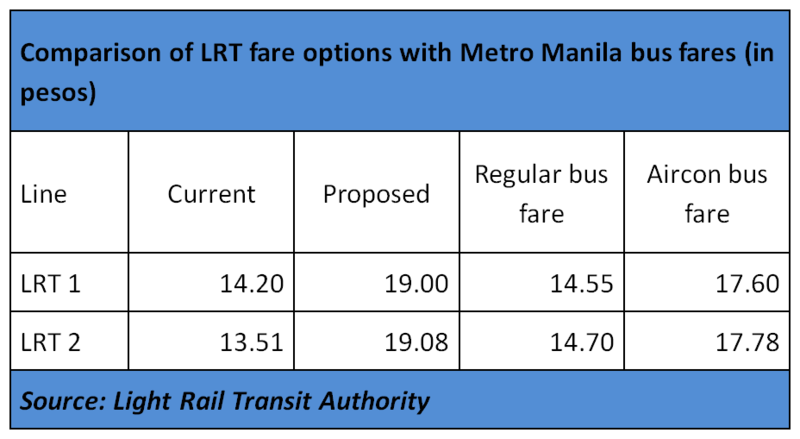 This simplified presentation, however, does not show the full and actual impact of the fare hike which can only be appreciated on a per station basis using the new fare matrix approved by the LRTA. Based on this new fare matrix, a train ride (single journey ticket) from LRT 1’s Baclaran station to Roosevelt will be 50 percent more expensive (from P20 to P30) while the fare from Baclaran to Tayuman will double (from P15 to P30). 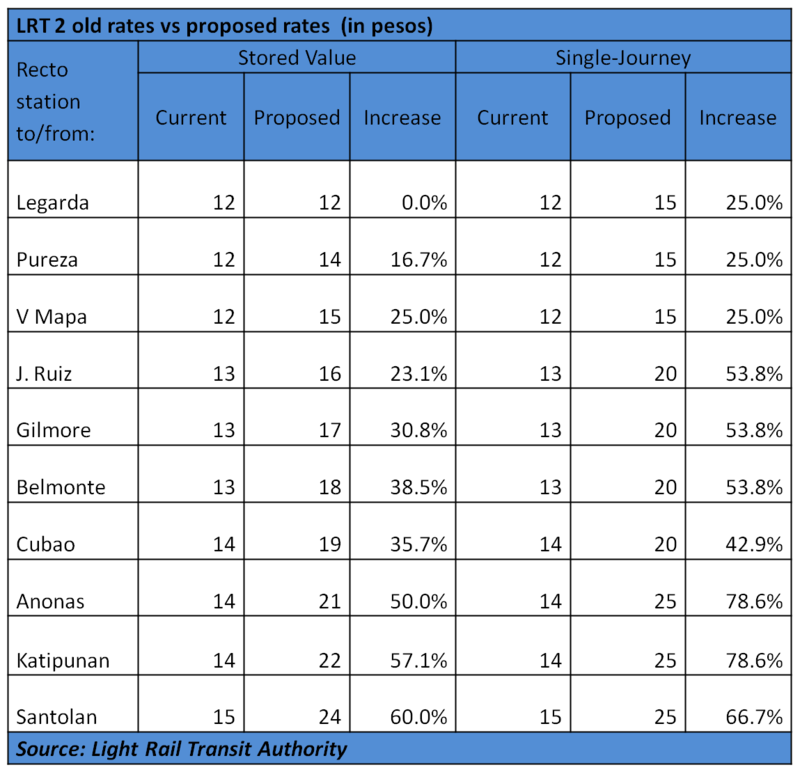 A train ride from LRT 2’s Recto station to Santolan will be 67 percent more expensive (P15 to P25) while the fare from Recto to Anonas will jump by 79 percent (P14 to P25). Based on the matrix, the biggest increase in real terms will be P15. So a worker or a student who regularly uses the train must shell out P30 more every day or P780 more every month (26 working days a month) to afford the train ride. 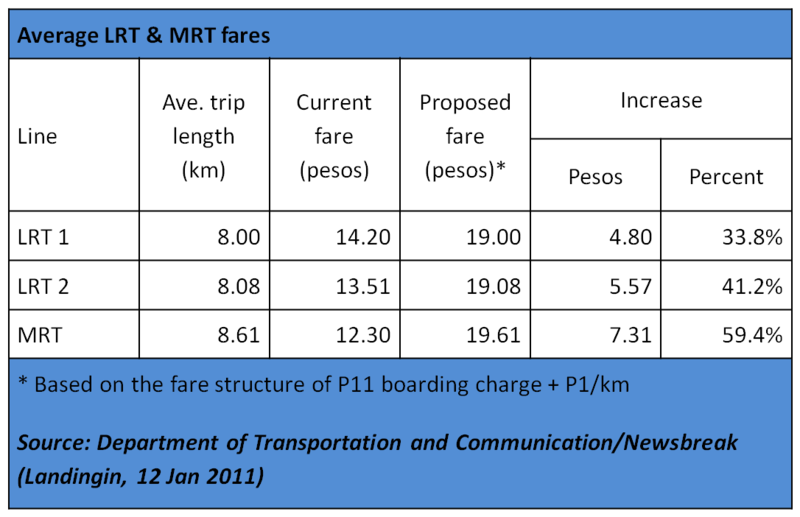 The lowest increase is P3 which translate to a monthly increase of P156 in transportation cost for the regular train commuter. ← New year, more hope? anu ba naman yan…bakit kaya hindi kunin ng government yung subsidy dun sa mga pork barrel ng mga senador at mga kongresista.di ba tatangalin naman na yon.edi dun kunin ng LRTA yung pang maintenence ng mga train…anung gagawin nyo sa tax ng mga tao..ilalaminate nyo. Ok naman un mag-taas ng rate, ang problema lang pangit na service ng LRT/MRT. Mayroon po tayong pasahero na buntis at mga matatanda, pwede po ba ipagawa ang mga scalators at elevators, parang ok lang kung mahirapan sila. Wag namn puro lugi reklamo ninyo , parang sardinas na nga mga tao sa loob ng train, lugi pa rin kayo.